What do I term this bond? I have known you for how long? Four or perhaps five years. With that calm and stoic smile. That I think you will never release. That I hope someday I will imbibe. I can still see through the eyes! Of the relief of seeing you fine. To read your latest post. Just remember, I am just a message away! With such hatred and ease. Let us shoot that too! Here’s to many more years, of brotherhood, good health and joy! HAPPY BIRTHDAY BP – An Ode to a Brother! The blog stops its journey here, today! The masks that I don, cannot continue to go on like this. At some point, one finds something that turns into one’s purpose. The clock goes on ticking. Made some friends, made a lot of foes, this journey no longer holds meaning or value. All that’s left here are broken pieces of scribbling of one soul who tried his best to fit in. A charade that can no longer go on! I wish you well. I shall still follow what you write and read your words when time permits. Farewell – This little place will remain here a testimony of one more soul who wanted to write, bring some difference into the world, but only made enemies! Thanks for all the memories, bitter and sweet. Bye! Today by a brilliant act of journalism in the New Indian Express. Listen to the embedded video clip when the heroic journalist names the group of blogger friends in Chennai. The kind of nonsense that two of my friends and I have to undergo all through the day on WhatsApp and Facebook is ridiculous. The representative Anup says “I bulk emailed the entire group but only few replies!” The gall of people who seldom are active in the group and sudenly questioning ethics and “integrity of bloggers” is a moment of awakening. When you are an admin in a group, you are answerable to all members. We try to be as fair as possible. No one considers the hours that we put into meet brands, authors, restaurateurs, entrepreneurs, the hours of travel, the emails, the calls, the driving. And we are accused in unsubtle terms that we are turning into paid bloggers who only write favourable stuff. I am sick and tired of this nonsense and so are the other two admins! We have learnt a wonderful lesson today. There are great stylists who wear wonderful smiles, pry out information and then say it was for some other event. Yes, we are babies drinking Cerelac – thank you! There are people in the community who silently observe everything and never comment! God knows, what pleasure they derive. When I posted the original email screenshot, I was clear, use your common sense, we have not leaked any email IDs, yet we are accused of things we did not do! The ghosts of the past – I have a dark past, today when a goon called up and spoke to me in the filthiest of words, I disconnected. This happened thrice again; the fifth call, I used a name from the past! The voice on the other side froze; it said “Bhai… Aslam paesaraen gnyabagam irukka?” I replied – “Nalla gnyabagam irukku thambi!” Pleasantries were exchanged and then there were no further calls. My past caught up with me today, yet again! How long till another fight? How long will I run??? It all started one evening when I noticed a post by a blogger friend Aravind Kumar about a book and if people would be interested in reviewing the book. 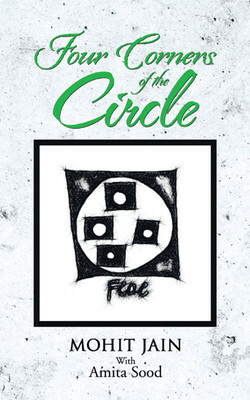 The title of the book was – ‘Four Corners of the Circle’. In a short span of about 30 minutes I was connected with the author Mr. Mohit Jain on Facebook and we were chatting. Mr. Mohit Jain is an eminent personality who has been influencing students at various levels through his teachings, mentoring, training and consultation for more than 16 years. He has a rich experience in the field of Quantitative Aptitude, Economics, Finance and Marketing Research. He is a visiting faculty member of various management institutes in Kolkata, Guwahati, Pune, Nasik, and Bangalore. Ever heard about the four corners of the circle? Since childhood, t has been taught in schools that the circle has no concern. Life is a never ending marathon. It keeps on revolving in circles and everyone is in search of a final destination, a corner that they never reach. This book is a small initiative to throw light on different aspects of the education system and how could we join hands to make it more productive. It guides the aspiring students to follow a right approach, take correct decisions, and overcome distractions in their career. It advocated that the educational institutions should focus on enlightening the lives of the students by providing quality education, quality learning ambiance, practical grounds to implement class room theories, and by helping students convert their black cat into a white one. The book is neither biased toward students nor educational institutes; the sole purpose is to provide their individual perspectives and reach to a common conclusion. The book contains five theories, which Mr. Mohit Jain has discovered in his sixteen years of teaching experience and which would help the youngsters reach closer and closer to their goals. The book is a fascinating piece of writing; coming from a teacher and mentor who has guided a number of students over the years to find their true-calling and achieve their dreams. The book is not a novel, wherein I can provide plot-points and create suspense and force you to pick up the book to help you unravel a mystery. This book is a small gem that takes incidents from the author’s life and traces his journey as a son, student, friend, teacher and mentor. In today’s result-oriented world; where everyone aspires to become an MBA; the book examines if an MBA is really worth it; does the MBA ensure guaranteed employment and success and other very pertinent questions. I would recommend every student who plans to write the CAT or similar preparatory test; or aspires to go abroad for higher studies to please buy this book and spend time reading the book. The book is simple, precise, crisp and direct in the presentation of the core-idea. There are interesting diagrams that add value to the book. The Nine Point Theory put forward and copyrighted by the author distills the essence of learning and the whole purpose of studying and perhaps living in a clear manner. I am sure that many people who read this book will look back in regret and wish that they had heard about this theory earlier. The author lists out the impact that his father had on him and thanks him for inspiring him to do what he is doing. He also credits his teachers, friends, family and students who have all added value to his life. Do read the book it won’t disappoint you! Post the Pizza party; I was waiting anxiously for an ice cream party and lo and behold the email from Deepa at Media Moments brought a smile on to my face. The date and venue were confirmed, some anxious moments ensued as enough bloggers did not respond; but all went well and on D-Day we had enough number of participants. Once again the flag of The Chennai Bloggers Club flew high as the usual suspects Bragadeesh, Gopal, Karthik, Srilakshmi, Aarti, usha and Sandeep were there in addition to other leading food bloggers from Chennai. We got to make our own variants of ice creams; some people tossed it into a cup others went for a waffle-based cone and it was fun experimenting like scientists devising medicines as we made delicious ice creams. The branch located in T.Nagar on Venkatnarayana Road near the TTD Temple is a beautiful and cheery little place. The staff are courteous and friendly, the washroom is clean and there is a sense of calm and happiness as one walks into the store. I would like to recommend a young kid named John who did some amazing tricks with a scoop of ice cream. I would like to thank Media Moments and Cream & Fudge for a delightful Saturday evening that was well-spent. No pictures this time around as the pics turned out very grainy and fuzzy – I guess will have to get a DSLR if I am to attend more such food-events!!!! So what are you waiting for? Beat the heat by digging into some of the sinfully delicious ice creams and sundaes offered by Cream & Fudge!